Here is the high quality, imported from Amazon Kerastase Resistance Bain Force Architecte Reconstructing Shampoo online in Pakistan. It is the premier product available for Kerastase Resistance Bain Force Architecte Reconstructing Shampoo online shopping in Pakistan. It is the bottle of 8.5 ounces. This is the exclusive reconstruct shampoo designed by house of Kerastese. Daily use of this shampoo will bring strength to your hair fibers and make them shinny and soft. It rebuilds the hair from the roots and brings life to your hair. This shampoo is imported in Pakistan for the consumers exclusively. This is normal hair shampoo. Enjoy Kerastase Resistance Bain Force Architecte Reconstructing Shampoo online shopping in Pakistan. Check here now this imported and high quality Shampoo Kerastase Resistance Bain Force Architecte Reconstructing Shampoo price in Pakistan and place your order now. It reconstructs the damaged hair and prevents breakage of hair. This is the quality shampoo that avoids split ends and protects the hair. We provide delivery facility and you can get this product at your home with cash on delivery facility anywhere across Pakistan. 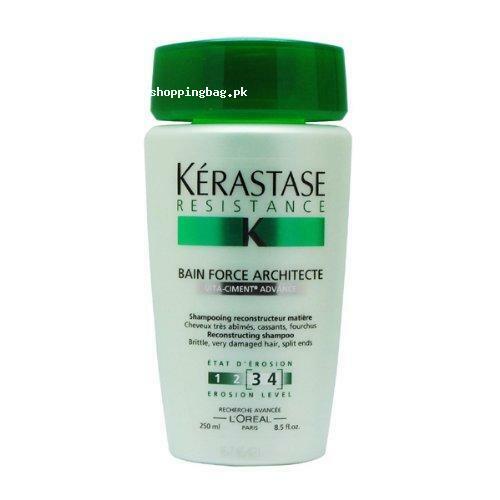 Buy Kerastase Resistance Bain Force Architecte Reconstructing Shampoo online in Pakistan and also find more exclusive and imported products at our online store collection of exclusive and imported Amazon products in Pakistan. You can find here Amazon imported stuff in reasonable price in Pakistan. Enjoy online shopping in Pakistan of this Kerastase Resistance Bain Force Architecte Reconstructing Shampoo and explore more.